A depression over the Bay of Bengal intensified into a tropical cyclone yesterday and Danger Signal-7 at Chittagong and Cox's Bazar and Danger Signal-5 at Mongla Port in Khulna were hoisted to warn people of the area about the storm. The tropical cyclone may make landfall in Bangladesh-Myanmar coastal region early today, Met office sources said. All activities at the Chittagong Port were halted since 3:00am yesterday and all commercial flights to and from Chittagong airport were cancelled amid inclement weather. Gusty winds were buffeting the country's coastal zone yesterday. Unusual tidal surge and heavy rain caused flooding in some areas. The Met office, which named the storm "Akash", forecasted last evening that Akash might move in the north-easterly direction and make landfall in Bangladesh-Myanmar coastal region early today. Akash was around 375km south-southwest of Cox's Bazar, 460km south-southwest of Chittagong port and 485km south-southeast of Mongla Port as of 6:00pm yesterday. Danger Signal-7 means a cyclone may make landfall with wind gusts of 62-88km per hour. "Sea will remain very rough," a special bulletin from the Met office warned people and instructed all fishing boats and trawlers in the northern part of the Bay to anchor at a safe place and remain there until further notice. The bulletin said Cox's Bazar, Chittagong, Noakhali, Feni, Bhola, Barisal, Patuakhali and Barguna and their offshore islands and chars might experience squally wind with gusts up to 90km per hour accompanied by heavy rainfall from yesterday afternoon. Loud speakers were used to notify people living in the coastal areas about Akash and ask them to move to a safer place or government cyclone shelters. The authorities concerned evacuated a few hundred people from a number of chars with no cyclone shelters in Galachipa upazila of Patuakhali. The government also opened up emergency control rooms in coastal upazilas yesterday. Squally winds, high tide and torrential rain left chars and low-lying areas of some coastal districts inundated with four to five feet of water. In the capital the effect of the cyclone was also seen. The sky was cloudy and it drizzled sporadically since noon. The Bangladesh Inland Water Transport Authority (BIWTA) asked all passenger launches shorter than 65 feet in length not to ply until further notice. They hoisted Cautionary Signal-3 for inland vessels. Our Cox's Bazar correspondent reports: Low-lying areas in Teknaf, Ukhiya, Kubdia, Chokoria, Pekua, Moheshkhali and Kutubdia upazilas were inundated with seawater due to tidal surges. Light rain continued through out the day in Cox's Bazar and its adjacent areas. Deputy commissioner of the district held a meeting with the district's Disaster Management Committee to discuss about their course of actions. Volunteers of Red Crescent and other non-government organisations and disaster management organisations have been asked to make necessary preparations. Our Patuakhali correspondent reports: At least 30 chars under Kalapara, Galachipa and Dashmina upazilas were inundated under five to seven feet of water. 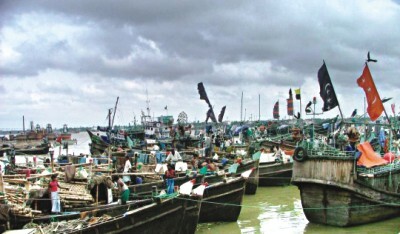 The Met office advised Patuakhali river ports to hoist Local Cautionary Signal-2. Our staff correspondent in Chittagong reports: The Chittagong Port Authority (CPA) asked all ships to anchor further upstream as the sea might get rough. The CPA opened up three control rooms to execute emergency operations from and to monitor the storm while Red Crescent Society and Chittagong City Corporation opened one control room each. Around 12:30am today the depression, centred around 100km off Cox's Bazar coast, was moving towards Chittagong with a speed of 80km per hour. Thousands of people of Saint Martin's Island, Teknaf and Cox's Bazar took shelter in nearby cyclone shelters last night. Four boats reportedly went missing at Paharchura in Teknaf while a general diary was filed with Teknaf police station at 8:00pm after another fishing boat with 14 fishermen had gone missing too. Power supply in Cox's Bazar remained snapped since 10:00pm yesterday while around 80,000 people took shelter in different schools of the area. Sea rose seven feet above the usual height of tide while rainfall in the last 18-hour was recorded at 53mm. "Gusty wind has sent our tin roof flying and we can see the wind bringing trees down to the ground," reported our Cox's Bazar correspondent who was in the cyclone control room in Cox's Bazar town. 6,655 volunteers from Red Crescent were working to bring people to the cyclone shelter as the storm damaged houses and establishments near the coast. "Sea waves are leaping high like mountains now and our house has already been flooded by sea water," Joynal Abedin, a shop owner at Saint Martin's Island, said over the phone at 11:00pm yesterday. "We are crying and praying to Allah as the wind is blowing with such a force that I won't even be able to go to a shelter now. Most of the people took refuge in cyclone shelters around 8:00pm," Joynal said just before the network connection was disrupted.